“Wherever You Are” was written in January of 2005 as I was preparing to head to the UK and EU for the first time touring with both heavy metal bands Fozzy and Stuck Mojo for about five weeks. Being prone to OCD and feeling quite anxious about the tour preparations both logistically and mentally, in a calm moment in the chaos this ballad came out of my head! Thanks so much for reading. I hope you enjoy! The Lowry Agency announces the release of a new promo video for Folklore: The Affliction, now on Kickstarter. The Lowry Agency/Club Fantasci in association with Greenbrier Games and True Fire Studios have developed a new promo video for Folklore: The Affliction. For more information about video production, please contact The Lowry Agency. Folklore: the Affliction is a dark fantasy role-playing board game for 1-5 players that does not require a game master. Adventure in a land steeped in fear, myth and superstition. Hunt or be hunted by creatures of antiquity and legend. Explore dangerous locales to find clues to the sources of evil sinking claws into the heart of the land, and decimating the populace. Defend the weak from the scourge of witchcraft and the demonic, the taint of lycanthropy and vampirism. Advance through highly immersive stories of epic scale with multi-layer character development in an on-going quest to drive the darkness back into the hell from which it came. The Lowry Agency reveals their new quick sell series for games targeted for industry distributors and retailers. Sep. 21, 2015 – Nashville, TN. — ] The Lowry Agency (http://www.thelowryagency.com) in association with Club Fantasci (http://www.clubfantasci.com) have announced their new video series entitled Quick Sell to the board game, role-playing game and card game industry. The series is based on a growing need for publishers to distinguish their game from other games coming out at such a rapid pace in this new era of gaming. The first game in the series to be featured is “Nevermore” by Smirk & Dagger Games (http://www.smirkanddagger.com.) 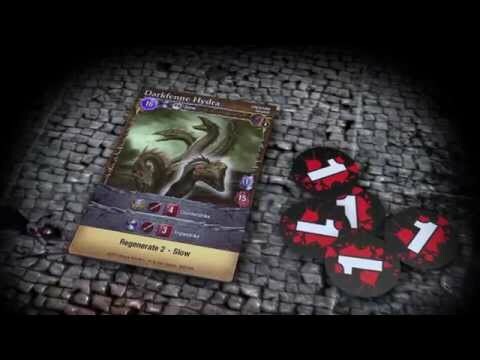 “Nevermore” is a unique drafting style card game designed by Smirk & Dagger President Curt Covert with spectacular artwork by Hannah Kennedy. “Nevermore” is loosely based on “The Raven” by Edgar Allen Poe. David Lowry also runs the board game/role-playing game blog Club Fantasci (http://www.clubfantasci.com) in which with the help of several other people, review board games, wargames, role-playing games, post industry interview, host contests as well as act as a news source for the industry. The Lowry Agency is full-service artist management/development, public relations and promotions agency. We work with musicians, actors, speakers, voice over artists, entertainment companies, music coordination/supervision for film and TV, board game industry and event promotions. The Lowry Agency/Club Fantasci in association with Arcane Wonders developed a new 7-step battle demo video for Mage Wars Arena. For more information about video production, please contact The Lowry Agency here. 3 White Noise… How To Seperate Yourself From It.